“There is a particular human pattern that Anhydrite is more than qualified to resolve. Deep feelings of abandonment plague many people, which cause immense emotional distress. The roots of these feelings can be, amongst other issues, residual memories from painful lifetimes. Anhydrite is a powerful healer, gently guiding us to release the past by understanding how pain can be our teacher. 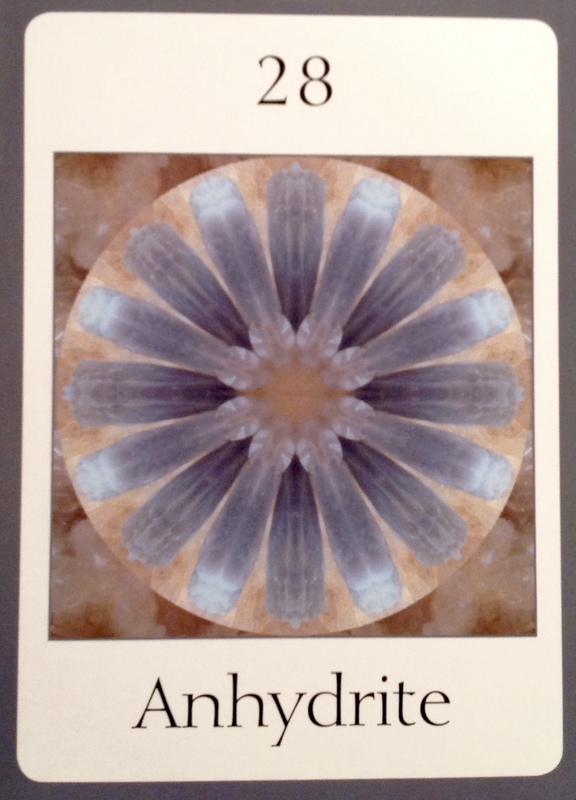 Anhydrite reminds us that we are not alone, are interconnected and embraced in the heart of the divine. What we have experienced as separation served us in reality to being guided to a deeper richer understanding of ourselves. The Anhydrite Oversoul helps us be who we really are. The mandala is a series of layered soft blues that twinkles in the light. It spins while making the most exquisite of sounds, rather like a cosmic choir. 16 beings reflect the consciousness of this powerful Oversoul. As we near the mandala we sense an incredible focus upon us. The beings welcome us with such warmth that our hearts swell. The beings are tall, crystalline and blue with large wings tucked behind their backs. They guide us deep within the mandala towards a temple. The temple, a vast Anhydrite, glistens softly through some unseen light source. Inside the temple we see a table carved from a single Anhydrite crystal, which we know we must rest upon. The beings inform us to lie on our fronts. They surround us and create a mandala. Our heart beats faster as we sense a powerful healing force focus upon us. Much of the fear that we experience in this lifetime stems from feelings of isolation and separation. This is the foundation of the healing which must take place in order for us to be healed as a species, and to be able to move forward in the ascension process. We must be able to see, feel, believe in and be a part of All That Is, in a tangible way. We must recreate our reality with this in mind, that we are part of something much bigger than we are. That we are an extension of the Divine. That we are exactly as we should be. The key to healing aloneness is Unconditional love and acceptance. Starting from within. We cannot move forward until we can heal our own hearts; our own beings. We must link our human heart to our eternal Soul through love. This means releasing judgment, fear, and many of the emotions linked to our survival instincts. It means opening not just our heart centers, but our higher hearts, found between the heart and throat chakras, which has been resting dormant for far too long. Our evolution as a species starts with one. You. Changing how you feel about you. Accepting and loving You. Finding peace, joy and love within You. It is You, shining your light and sharing your gifts. It is You, remembering your importance. You, stepping on to your path. You, healing and moving forward. As You do this, You will inspires others to as well. This is the next step in our ascension.